Probably one of the biggest obstacles that a lot of homeowners face when it comes to renovating their home is what type of paint that they should choose. There are actually two different types of paint that they can choose from – water based latex paint or oil based paints. Many homeowners are not sure of the differences between these however , the answer is actually quite simple. When you are looking to paint doors, trim, and any other high traffic areas you may want to use oil based paint and for your walls you may like to use the water based latex paints. Another big difference between the oil based and latex paints is that the oil based paints are harder to use than latex paints. This is because the oil paints are thicker and because of this you have to use a variety of different brushes and rollers. Also when you are working with oil based paint you have to ensure that the area that you are working in is well ventilated as it gives strong order. The great thing about the oil based paints however is that you will find it readily available at any local paint store and it can also be tinted to just about any color that you can imagine. The latex paints on the other hand are a lot easier to work with and they will not have such a strong odor as the oil based paints have. They are a lot thinner than oil paint as well which means you will not need specific paints or brushes. You can however also find the latex based paints in your local paint store and it can also be tinted to any color. When you are using oil based paint you will need to prime the area first before you begin painting to prevent the paint from peeling. With latex based paints you won’t have to prime before you paint. A great disadvantage that a lot of users find with oil based paints is that they tend to bubble during the painting process whereas the latex paints do not bubble. When you are working with the oil based paints you have to ensure that you stir the paint and do not shake it. You should also consider only using one coat when you are using oil based paint. With latex paint you can do a couple of coats for more even cover. The oil based paint will also take longer to dry than the water based latex paints do. Also the oil based paints are considered toxic and they are hazardous. The water based paints are safe to use and they not toxic. 1.When you are looking at painting doors, trim and high traffic areas you need to use oil based paints. Walls should be latex paint. 3.You will need to prime the area first with oil based paints. 4.Oil based is toxic and hazardous and latex paints are not. Manisha Kumar. 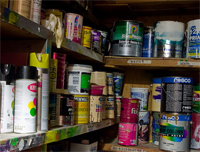 "Difference Between Oil Based and Latex Paint." DifferenceBetween.net. October 21, 2009 < http://www.differencebetween.net/object/difference-between-oil-based-and-latex-paint/ >.